I spoke to a group of Investors and their investee companies this week. About 2/3 of the room raised their hands. I was surprised… so I asked a third question. ‘Is there anyone who is not an owner or an investor?’ No hands. It was time to break the big news. Having asked these questions of audiences many times, I guess I shouldn’t be surprised at the response I get. At first, I could hear a pin drop. Then there is rustling as people start to squirm in that silence. I can see the wheels turning. Then suddenly the light bulb goes on. 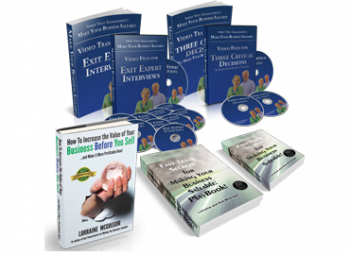 Most business owners don’t recognize they are the primary investors in their business. Investors are outsiders in their mind, not insiders. ‘How many of you are investors in a business?’ This time, sheepish grins appear on faces as every hand goes up. ‘How many of you want a return on your investment in your business… it is an asset?’ More grins, more nodding, all hands. LEARN Learn to think like an investor: your business is an asset you will sell one day. PREPARE Do not call a broker the year that you want to ‘test the waters to see if anyone wants to buy your business’. Make it saleable 2-4 years before you want to sell and watch the buyers line up at your door to give you offers. COMMIT Decide what you want to sell it for and then do the work to make the business worth that number. 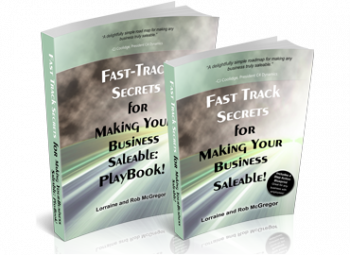 DETACH Your business needs to thrive without you and do so long after you’ve gone. Let go emotionally long so it can fly and you can move on to your next act. To start your learning process, start reading. 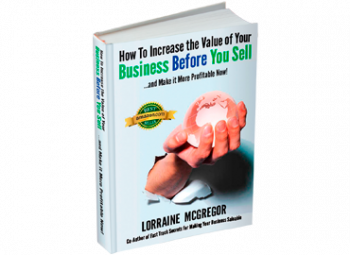 Get “How to Increase the Value of Your Business BEFORE You Sell… and Make it More Profitable Now!” available here.